With summer comes camping trips, whether setting up a tent next to your car or backpacking to a remote slice of wilderness. In both cases, campers need food. 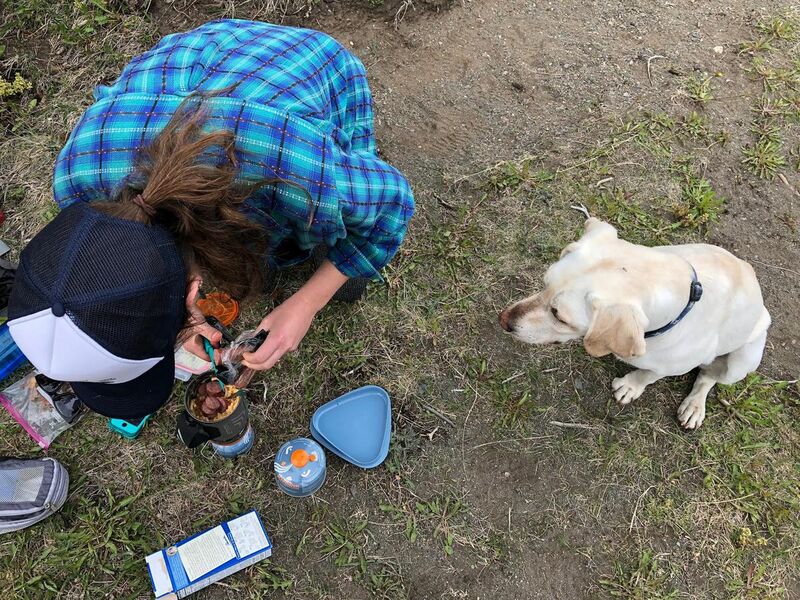 ADN recently asked Alaskans to share their favorite meals to cook while camping, and people responded with an array of dishes, from kebabs to casseroles to soups. Here are 11 ADN readers' favorite camp meals, plus three staff recommendations. Responses have been edited for clarity and length. I make a hearty quiche prior to the camping trip, then wrap pieces individually in foil and freeze. I put the frozen pieces of quiche in a cooler, and they help keep it cold the first day, then are pretty thawed by the next day. They can be tossed near the hot fire to heat up for breakfast. The possibilities are endless with quiche — meat or no meat, spinach, broccoli, cheeses, etc. Pick your favorite recipe. No pans to clean up at the campsite! I usually don't eat ramen noodles at home but they are great for camping. Green onions always add a nice sweetness to the broth or, if you want to kick it up a notch, slice a few fresh jalapeño rings. I love to jazz up the ramen with some Korean rice cakes and Japanese oden (fish cakes). Toss in some kimchi and egg and you are good to go! We loved group camping when our kids were little, and we would meet our friends at a campground for the weekend. We always did a potluck on Saturday and would invite everyone to bring something fun to kebab — parboiled redskin potatoes, beef chunks, sausages, corn on the cob, pineapple, hot dogs, brussels sprouts, you name it! It was always a feast. Great way to make a lot of food easily, too! Couscous is the easiest grain to make — boil water, toss the couscous in, cover and wait five minutes. You can buy it in bulk or as a box in the market and just leave the cardboard at home for recycling. If you buy in bulk, use 1 1/2 cups water for a cup of dry couscous. We usually toss the sun-dried tomatoes in with the couscous so they soften at the same time, as well as broccoli that we'd chopped before heading out, so it cooks lightly. When the couscous is done, fluff/stir, and then add in the nuts (pine nuts or cashews), and garlic, olive oil to taste, salt and pepper to taste. Easy, nutritious, lightweight in the pack. Follow instructions on box, but replace milk and butter with cream cheese. For a bonus, add reindeer sausage. For an easy transport of fresh eggs, we break each of them into a pitcher. Then it's easy to pour (plop) out as many eggs as needed and put pitcher back into ice chest. No breakage! Another tip: Cook the omelet in a bag. Pour the eggs into a large, resealable bag. (One bag per omelet.) Press out most of the air and seal. Shake or squeeze the eggs. Open the bag again and put in any add-ins. Everyone can choose their own: cheese, meats, veggies, herbs. Press out the air, seal the bag and drop it into a pot of boiling water. Cook for 13 minutes, according to this recipe. What's better than breakfast for dinner? This cooks for two hungry backpackers. Dice your potato, onion and bell pepper. Put your pot or skillet on a medium to high flame and let it heat for 30 seconds to a minute, then add half the oil. To test for appropriate heat, put one piece of onion in the pot and listen for a nice "TSSS." Once the pot is hot enough, put in the potato, onion and pepper. Stir occasionally and put the lid on to cook the vegetables faster. Once nearly cooked, dice summer sausage and stir it in. Make a well in the vegetables and crack eggs into pot, then scramble with a fork. Incorporate spice and cook until eggs are done. Enjoy this savory, diner-worthy meal! Perfect for camping! It's quick and easy as well. At camp, I use a large pan and start with the bacon and kielbasa. If cooking on a camp stove, use low to medium heat. On a campfire, the pan will need to be moved in and out of the heat if it's too hot. I cook until the bacon is almost crispy. I then add the vegetables except for the tomatoes and cilantro, making use of the grease from the meat. I add about a teaspoon of Johnny's Seasoning Salt. I fry them about 3 minutes. Stirring frequently. I then add butter, if needed, and then the eggs. I scramble it all together and cook until eggs are firm. I turn off the heat and lay my tortillas over top of the whole dish in the pan — both to cover the food and warm the tortillas. 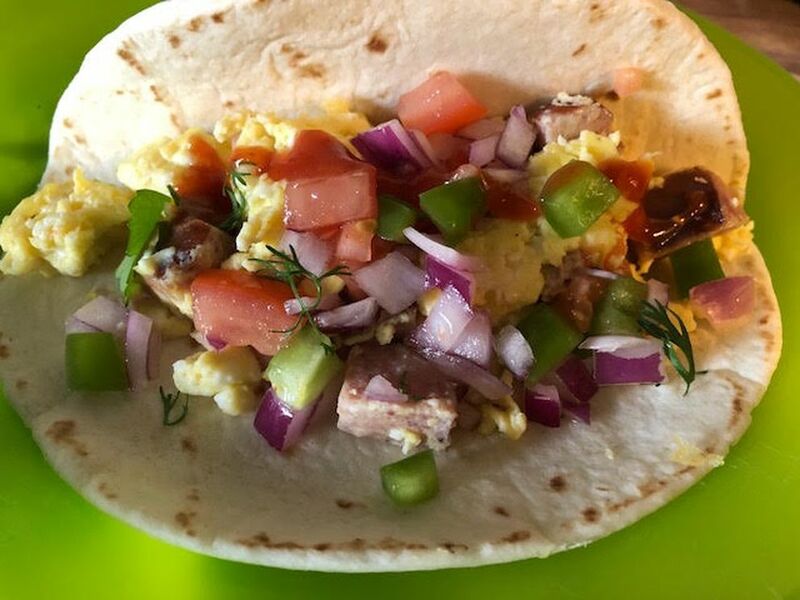 I then add egg scramble to each tortilla, add tomatoes and a bit of cilantro. Voila! Feeds about four people. Take one yellow onion per person and throw them skins and all into the coals and cover with more coals. Leave there until the skins are ash, about 35 minutes to an hour. Meanwhile, on a piece of foil, take a can of Spam and slice it almost down to the bottom (but not all the way through), and stuff Monterey Jack cheese in between the slices. Throw a small can of green chiles over it and wrap the foil to seal. Heat in the coals until cheese is melted and the whole thing is hot. Serve the onions as a side dish, drenched in butter and maybe a bit if balsamic vinegar, if you have it. (I plan for it.) This all is best with boiled or heated canned spuds. Line Dutch oven with heavy-duty foil and coat with cooking spray. Pour egg mixture into Dutch oven and cover with lid. Place the Dutch oven over eight to nine coals and place 16 to 17 coals on top. Bake 35 to 45 minutes, until hot and bubbly and the egg mixture is cooked through. We make this all the time, including while taking a camping trip in Seward. We brought all the ingredients with us. Very easy to do over a campfire. In medium pot, add canned ingredients with juices, diced onion and ranch. Bring to a boil and stir frequently. In a medium pan, brown the ground beef, remove grease add 1/2 cup water and taco seasoning, bring to a boil. Add ground beef mix to beans, lower heat to simmer and cover, stirring frequently until onion is soft. 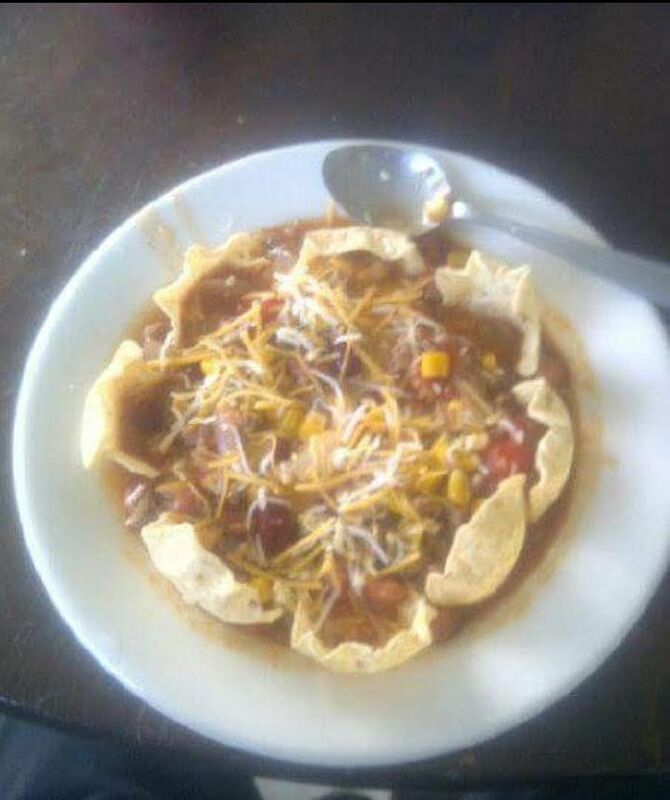 Remove from heat and serve with tortilla chips and shredded cheese. In the stuff-in-foil genre: Slice open a banana and stuff some chocolate (and nuts, caramel, whatever tickles your fancy) inside, wrap it in foil and toss it on the fire. 13. 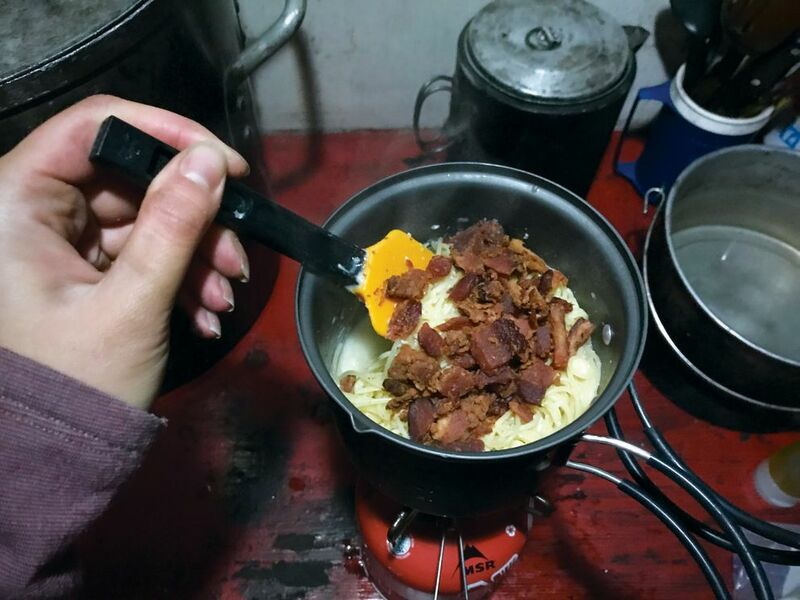 Backcountry carbonara recipe — Vicky Ho, deputy editor/online and author of the ADN column "Cautionary Tales"
I've made this pasta dish (adapted from Fresh Off the Grid) a few times with varying levels of precision. Sometimes I add more cheese, sometimes I add more bacon. It'd be nice with a handful of baby spinach, wilted at the end, or some broccoli florets boiled with the pasta. When you unexpectedly have to spend the night at the base of a rocky ledge surrounded by snow in Hatcher Pass, and you're cold, tired, wet and hungry, this just might be the best thing you've ever tasted. At home: Break the angel hair pasta in half or in thirds, and store in a resealable bag. Pour some olive oil into a small, leak-proof plastic container (I use one that came in a set for travel toiletries.) Pre-mix the Parmesan, pepper and parsley in a resealable bag. 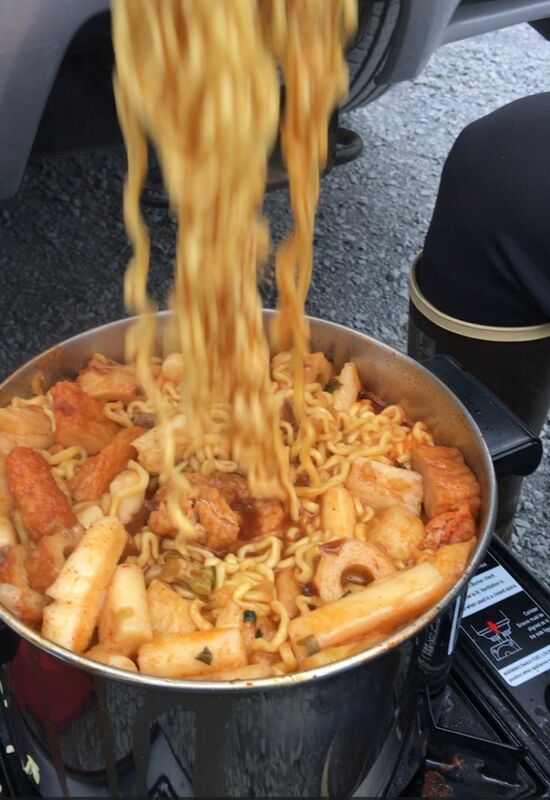 At camp: Put the pasta in a pot and pour in enough water to barely cover the noodles. Bring to a low boil; cook until just al dente. Leave pasta water in the pot; do not drain. Immediately add the olive oil, powdered eggs, Parmesan, pepper and parsley, stirring to make a creamy sauce. Once combined, stir in bacon crumbles. Note: In cold weather when I'm planning to have a hot beverage, I'll add more water for cooking the pasta and pour the excess into a mug for starchy hot chocolate or coffee, to save time and cut down on fuel use. Take a vote and decide on pizzas. Call your favorite pizza spot and order your pizzas half baked. Pick up at agreed-upon time. Let them cool and wrap them in foil. This is also a good time to portion. Transport to campsite and start roaring fire. Vent foil. Position pizzas on racks or rocks near fire and complete baking. Enjoy with a beer or ice-cold soda. What's your favorite meal to cook while camping? Tell us about it in the comments. Related: ADN readers and staff share their favorite Anchorage-area hikes.